Sold in continental U.S. and Puerto Rico only. Basic and Data Logging Models are also available. Pump kit includes air sampling pump, communication enabled charging dock with power adapter, filter cassette holder, tubing, 2mm hex key, charcoal tube holder, a user manual on electronic media, and Gilian Pump Management software. Three-Pump and Five-Pump options come with 3 or 5 of the mentioned above, plus a carrying case. 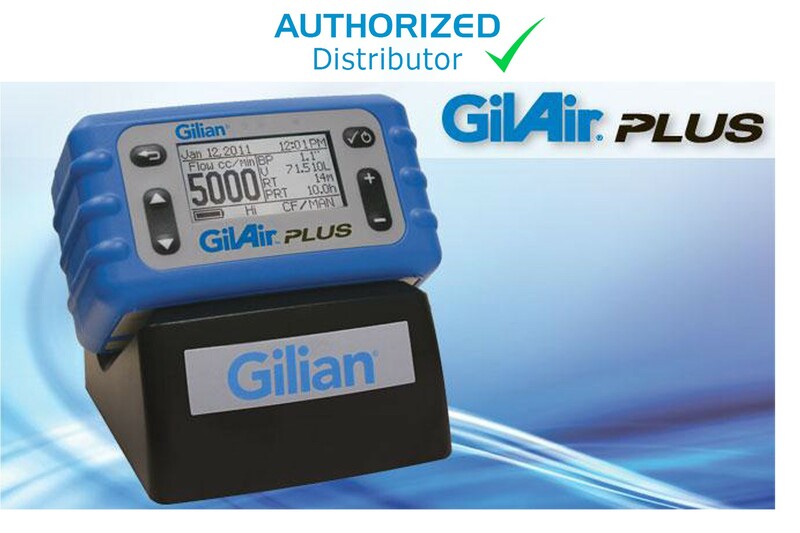 Personal Industrial Hygiene Air Sampling Pump - The GilAir® Plus features wide dynamic flow and pressure ranges to address all personal air sampling methods with flow ranges between 20 and 5,000 cc/min. With patent pending QuadModeSM air sampling technology, the GilAir® Plus can perform both high-flow constant pressure and constant flow (450-5,000 cc/min) and low-flow constant pressure and constant flow (20-499 cc/min) with a single pump without external adaptors. It’s like getting two pumps in one. PC ApplicationGilAir® Plus is a smart air sampling pump that provides ambient or standard temperature and pressure corrected display (STP model) and data-logging for up to 16 sampling events (STP and Datalog model). The pump has high back pressure capability of up to 40" H2O in high flow and up to 25" H2O in low flow. An automatic self check system ensures sample accuracy. In the event of a fault condition, the pump’s selectable automatic fault recovery feature attempts to restart the pump up to 10 times every 3 minutes to determine if the fault condition has been cleared. Easy-to-read, backlit displays an intuitive menu, keypad interface and large, easy-to-read back-lit display makes adjusting pump settings quick and easy. Once the pump is set up, the keypad can be locked to prevent tampering. Convenient and innovative SmartCalSM feature provides automatic pump calibration. Compact Personal Air Sampling Pump. One-third smaller than traditional personal air sampling pumps and weighing less than 21 oz. (595 g), the GilAir® Plus provides superior operator comfort. An integrated belt clip securely attaches the pump in a horizontal position, allowing workers a full range of motion to perform a wide variety of tasks without interference or discomfort. Multi-pump Docks. The GilAir® Plus dock provides charging and communication functions for the STP and data-logging models. Once docked, the PC application allows users to review datalogs, generate sampling reports, manage sampling programs, and create pump set-up profiles that expedite deployment of large pump fleets. The SmartCalSM feature uses the dock as a communication link between appropriate calibration devices and the GilAir® Plus. SmartCalSM automates calibration and records pre and post sample calibrations in the pump’s datalog.